Bio Fuel Fire Bowl is an interesting new collaboration between fireplace specialist AGNEWS Fireplaces and Lump Sculpture Studio, Australia's premier designers and creators of contemporary art. 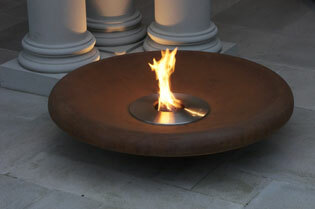 The exciting new Bio Fuel Fire Bowl is the product of an interesting collaboration between two industry leaders. Fireplace specialist AGNEWS Fireplaces and Lump Sculpture Studio, one of Australia’s premier designers and creators of contemporary art and outdoor sculptures. Chris Vassallo, principal sculptor with Lump Sculpture Studio explains “Our wood-burning Fire Bowls have been a popular choice with architects and designers for quite some time now. 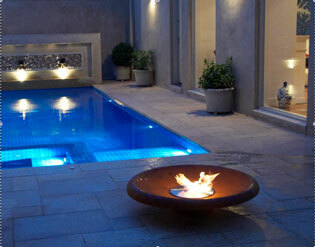 We’re proud that Fire Bowls have found their way into numerous projects around the country. Although the original wood-burning versions have their unique character and remain popular, we identified some projects where a simpler integrated burner system might suit better. Rooftop gardens for example, where managing timber fuel stocks can be difficult. That’s when we called on the expertise of AGNEWS Fireplaces to help find the right fire system for the Fire Bowl. AGNEWS came up with a slick Bio Fuel Burner kit that proportions well with the Fire Bowl and provides the dramatic flame effect we were looking for. The burner is easy to manage, it runs on ethanol, a renewable clean burning liquid fuel. 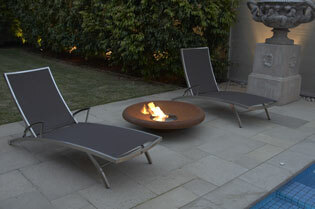 The Bio Fuel Fire Bowls are available in two finishes, marine-grade Stainless Steel and Corten for the `weathered look’. Visit www.agnews.com.au for more information.